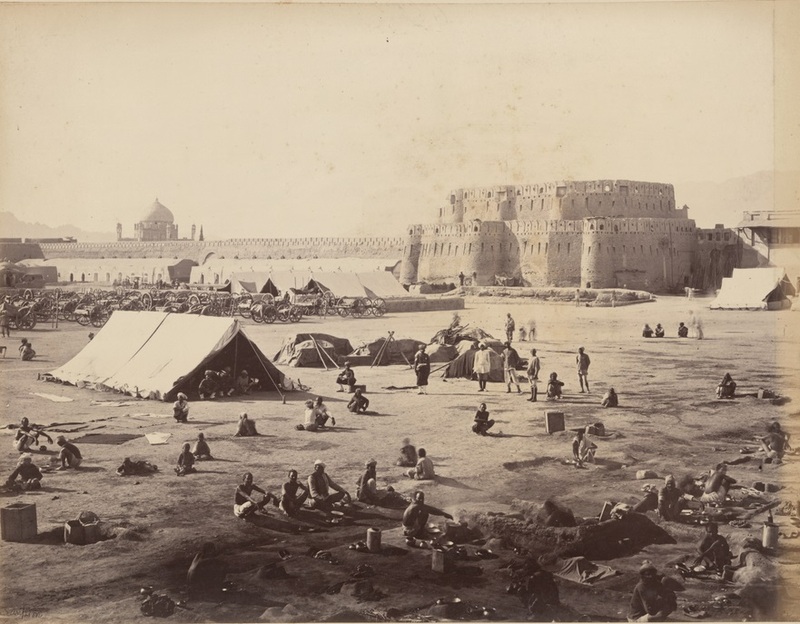 Description: Camp belonging to the British and allied forces at Kandahar after the 1880 Battle of Kandahar, during the Second Anglo-Afghan War. After the defeat of Ayub Khan's forces and his escape to Persia (Iran), the British helped Abdur Rahman Khan become the new ruler of the country and Kandahar was re-united with the rest of Afghanistan. The defensive wall around the city was removed in the early 1930s by the order of King Nader Khan, the father of King Zahir Shah. Permission: This work is in the public domain in its country of origin and other countries and areas where the copyright term is the author's life plus 70 years or less. You must also include a United States public domain tag to indicate why this work is in the public domain in the United States. Note that a few countries have copyright terms longer than 70 years: Mexico has 100 years, Jamaica has 95 years, Colombia has 80 years, and Guatemala and Samoa have 75 years. This image may not be in the public domain in these countries, which moreover do not implement the rule of the shorter term. Côte d'Ivoire has a general copyright term of 99 years and Honduras has 75 years, but they do implement the rule of the shorter term. Copyright may extend on works created by French who died for France in World War II (more information), Russians who served in the Eastern Front of World War II (known as the Great Patriotic War in Russia) and posthumously rehabilitated victims of Soviet repressions (more information). This file has been identified as being free of known restrictions under copyright law, including all related and neighboring rights. This work is in the public domain in its country of origin and other countries and areas where the copyright term is the author's life plus 70 years or less. You must also include a United States public domain tag to indicate why this work is in the public domain in the United States. Note that a few countries have copyright terms longer than 70 years: Mexico has 100 years, Jamaica has 95 years, Colombia has 80 years, and Guatemala and Samoa have 75 years. This image may not be in the public domain in these countries, which moreover do not implement the rule of the shorter term. Côte d'Ivoire has a general copyright term of 99 years and Honduras has 75 years, but they do implement the rule of the shorter term. Copyright may extend on works created by French who died for France in World War II (more information), Russians who served in the Eastern Front of World War II (known as the Great Patriotic War in Russia) and posthumously rehabilitated victims of Soviet repressions (more information). This file has been identified as being free of known restrictions under copyright law, including all related and neighboring rights.